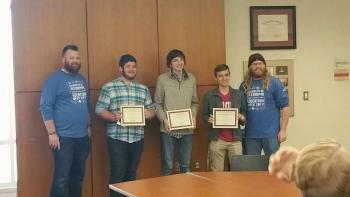 GHS Students Win Computer Coding Contest at OU! 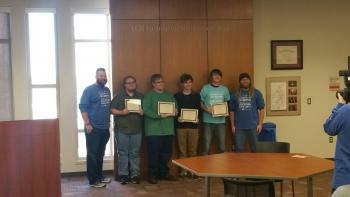 GHS students competed in a computer coding challenge at the University of Oklahoma bringing home 1st and 3rd place in the competition. 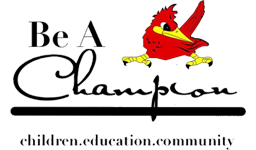 Members of the 1st place team are: Paul Paquin, Eric Razey, Tyler Toomey and Timothy Ryan. Members of the 3rd place team are: Nick Shirloff, Jacob Houck and Ethan Wallace. Both teams are coach by Mr. Dusty Crowder. Way to go coders!!! 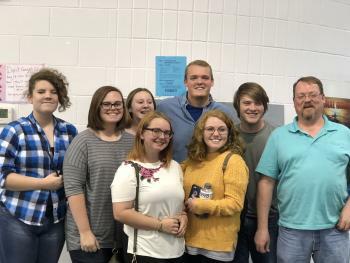 Grove High School Academic Team wins Regionals! The GHS Academic team won Regional competition, Saturday, November 11. They will advance to Area contest on January 13, 2018. Good luck Grove High School Academic Team! Grove High School Speech & Drama win Sweepstakes at Bishop Kelly! Girls Cross Country Qualified for State Competition! Grove High School Marching Band Received Superior Rating at State! Cheerleading Qualified for State Competition! Lady Red Softball Qualified for State Playoffs! Mrs. Angie Duff was recognized as being Grove’s Most Favorite Teacher. She was selected through Arvest Bank’s social media campaign of identifying area school district’s favorite teachers. 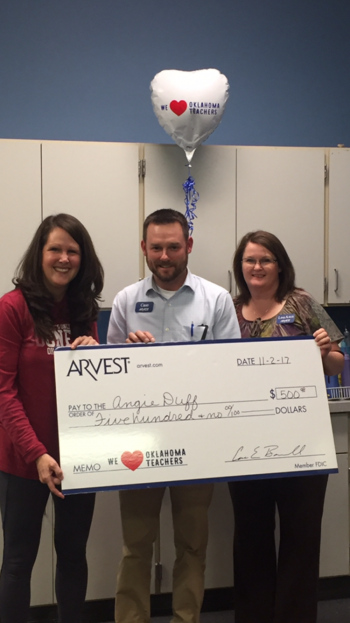 Arvest provided Mrs. Duff with a gift basket and $500. Thank you Arvest for investing in our teachers! 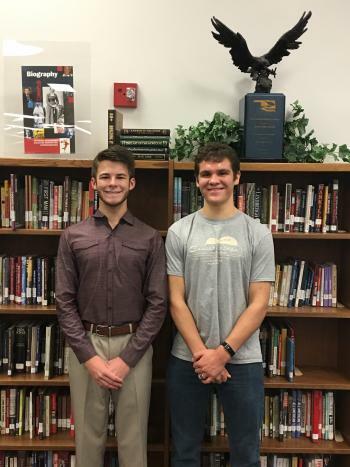 Grove High School is proud to announce that Andrew Wallace and Ben Cloud have been names Semi-finalist for the 2018 National Merit Scholarship Program. Over 1.6 million students entered into the 2018 National Merit Scholarship Program by taking the 2016 Preliminary SAT/National Merit Scholarship Qualifying Test. Andrew and Ben rank among the top 16,000 semifinalist. 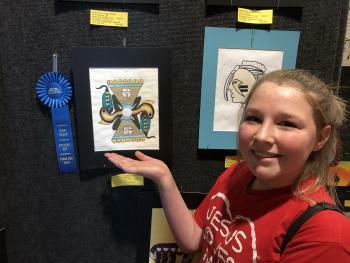 Students advancing to Finalist will be notified in February. Congratulations Andrew, Ben and Grove Public Schools! See the Tulsa World article here. Andrew Carroll will make Grove his only stop in Oklahoma on a cross country campaign, in conjunction with the opening of his play in Grove, If All the Sky Were Paper, which contains some of the most extraordinary war letters ever written. Mr. Carroll will speak to all Grove High School students on September 15. “If All the Sky Were Paper” by Andrew Carroll opens September 15 and runs for 10 performances through October 1, 2017. This compelling drama was created from Carroll’s New York Times bestselling books, "War Letters" and "Behind the Lines," and features the best of his Legacy Project’s never-before-seen letters. It was taken from actual letters penned by troops and their loved ones. From the incredible drama of the human experience in battle to the pathos and humor of everyday life on the war front and the home front, audiences have been moved and inspired by the correspondence of those caught up in the war experience. It is an evening of personal and moving memories from American soldiers and their loved ones at home, from the American Revolution and Civil Wars to the two World Wars, Korea, Viet Nam, Iraq and Afghanistan. It also includes letters from people from other countries caught up in these wars. “These war letters are more deeply moving, more revelatory, and more powerful that any dispatch from the front.  It’s the truly felt history of what war is all about.” Studs Terkel. “In 1998, Carroll launched a national, all-volunteer initiative, the Legacy Project, which worked to find and preserve wartime correspondence. Carroll traveled to all 50 states and 40 countries, including Iraq and Afghanistan, to seek out what he calls "the world's great, undiscovered literature." He has collected more than 100,000 previously unpublished letters and emails from every conflict in U.S. history. He has edited a book of writings of the troops for the National Endowment for the Arts, "Operation Homecoming." His latest book, My Fellow Soldiers,” and others are on display at the Grove Public Library. In April, 2017 he embarked on the “Million Letters Campaign” to seek out and preserve at least one million war-related correspondences from every conflict in U.S. history, from handwritten missives penned during the American Revolution to emails sent from Iraq and Afghanistan. He is traveling throughout the country to encourage people to donate their war-related correspondences to “Center for American War Letters” so that they will be preserved forever. The Center currently has over 100,000 letters which are not only preserved, but are shared with the public in a permanent exhibit. See: http://warletters.us. High School Special Education students received a $10,560.00 Corkle Foundation Grant for Chromebooks. Thank you! Grove Public Schools received $30,000 from Seneca-Cayuga for after school programs. Thank you Seneca-Cayuga! Upper Elementary STEAM Block Teacher Lu Ann Dubois received a $10,000 Corkell Foundation Grant. Grove Upper Elementary 2017 OETT Technology Grant recipient in the amount of $40,000. The Northwest Arkansas Naturals had the pleasure of having the Grove High School Ridgerunner Marching Band perform before our game tonight, as well as the National Anthem. As you would expect, they were fabulous and started off a wonderful evening at Arvest Ballpark. Even more impressive, they represented themselves in a very mature and professional way, both on the field pregame and during the game around the ballpark. Things like that don’t get unnoticed by our staff and you should be very proud. I also want to personally compliment Joe Wilhelm as he was fantastic to work with to plan the event for his students. You are very lucky to have him in Grove and his students are blessed to have him as a teacher. Grove High School teachers Jeanne Smith and Shelly Crawford will soon have new technological tools for students to use in their classrooms. Both teachers recently received Career Tech Lottery Grants for implementing Innovative Technology in their classrooms. These are competitive grants that Grove High School is very fortunate to have received. Jeanne Smith is the lead teacher for our Science, Technology, Engineering, Mathematics (STEM) programs. Shelly Crawford is our Family & Consumer Science (FACS) Teacher. We are proud of these ladies for thinking outside the box and continuing to update the opportunities for students to use current industry standard technology in their classrooms!